When my husband and I married, we both already had well-stocked homes in terms of tangible things. So when we received cash or checks as wedding gifts, we chose to use that money to create a fully stocked pantry including long-term food items such as whole grains, honey, olive oil, etc. The problem was though that I wasn’t exactly familiar with how to use those kinds of items. Somehow it just didn’t right to purchase items only to stash them away in the corner of the basement and forget about them. So, I decided to start learning how to use what I had on hand. Doing this actually led me to see holes in my supplies and enabled me to start asking myself “what if” kinds of questions. In spite of the gross poverty I witnessed in the Philippines, whenever a good meal was served, it was always a celebratory occasion and one worthy of singing and laughing sharing. As a result, I found that my missionary experience influenced a lot of my “what if” kinds of questions. For example, “This homemade bread is delicious but what if I had to make it without electricity like I experienced so often in the Philippines?” Consequently, I’d find a solution, use it, and then come up with another slew of “what if” kinds of questions. Living this way led to me discovering many other areas of essential living that required the same kind of “What if” questions followed by the solutions. The goal my husband and I had set for ourselves was that any time we found a vulnerability in our everyday living, we’d find a way to counter that scenario and replace a vulnerability with peace. This thought process is what led me to learn that “emergency preparedness” was just the tip of the iceberg and that if I actually focused on realistic solutions for the everyday challenges that come our way, I’d inevitably be ready for the more serious crises. 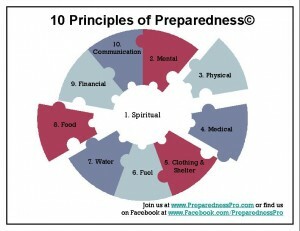 It was during this period that my husband and I came up with the Ten Principles of Preparedness. Each time we came up with another vulnerability in our life, we would essentially de-construct the scenario and follow the ripple effects of that scenario backwards so that we could be sure that we addressed the initial trigger of the sequence. When the Teton Dam broke, there were all kinds of small things that could have been taken seriously that would have prevented the entire collapse, but engineers and work crews only saw those warnings as insignificant distractions. Our idea was to focus on what some may see as “insignificant distractions” in an effort to eliminate the catastrophic crises. I’m convinced that you won’t find any holes in this list nor will you find the need to re-prioritize them. They follow the natural flow of our everyday living as well as the moments that zip by in a crisis. You’ll also find them to be closely connected to each other, like the cogs and wheels inside a clock. The nice thing about making this discovery was that I no longer had to worry about spending too much time or resources in an area that had lesser prominence than another. It also gave me a good snap-shot anytime I checked the list as to what we may be more vulnerable. Lastly though, discovering this list helped us graduate to an even more advanced way of living. 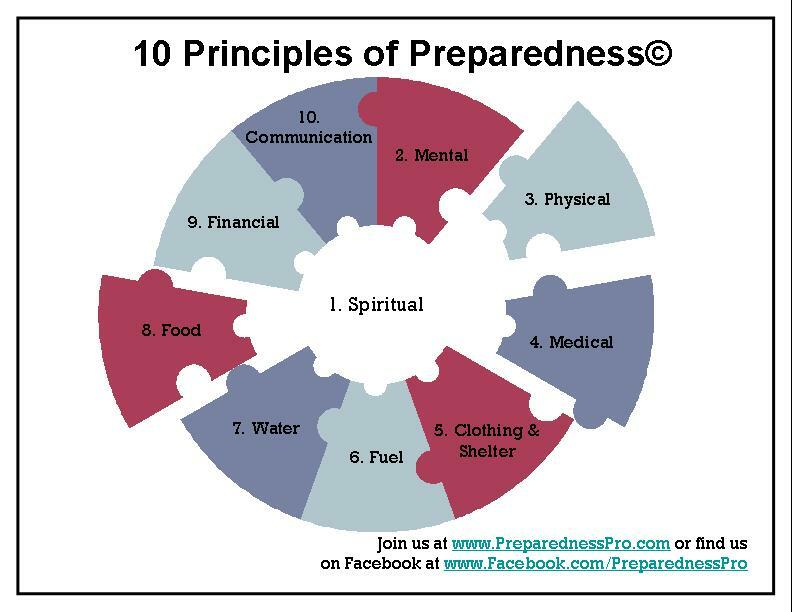 With our eyes more open to our life as different aspects of it falls into one or more of the 10 Principles of Preparedness, we began to have a greater level of awareness as to many of the threats in our society which would compromise any one of those 10 Principles. I’ll never forget the day that Scott and I had come to realize that the threats of disruption that we were bombarded with actually came at us in the SAME order of prioritization as the Ten Principles. For example, if we looked at snapshot of headlines in the news or the incidences of history which would threaten the stability of any one of these Principles of Preparedness, we noticed that there was a direct correlation to the amount or intensity of threats and the level of prioritization of each principle. For example, Spiritual Preparedness, that of a person’s core values, beliefs, and standards of morality, is the biggest target of opposition, and there are very few threats which don’t have an impact on this particular Principle in one way or another. I don’t know about you, but I tend to look at challenges in life as a part of a big strategic game. If the opposition prioritizes a particular area of my defense, then there has to be a reason for it, a rationale that makes this particular area important to “them.” If that’s the case, then shouldn’t I be just as concerned with protecting that particular area? Ironically, not only were we able to verify the prioritization of the Principles based on how they applied to everyday life, but we were also able to confirm the prioritization of those Principles based upon the intensity of the attacks against them. Furthermore, recognizing this level and organization of attack led us to our most recent advancement in our understanding—a self-sufficient lifestyle. As long as there are people upon the earth there will always be the errors of men who act in fierce opposition to a self-sufficient lifestyle and subsequently each of the Principles of Preparedness. As such, this means that we’ll never be finished with our preparedness efforts. We’ll never be able to completely check something off of the list because it’s a natural state of progression to take care of one’s own needs and stand self-sufficient in providing for our every need. And the natural progression along that path is to begin to share that stability with others who might come to need a bit of assistance too. It’s as natural as wanting to throw a couple coins in the kettles at Christmas or instinctively putting your arm up in front of the passenger as you go to make a sudden brake in the car. But because of this natural tendency, we’ll never get to check off a particular item or skill that we need because new scenarios will always be cropping up as will there always be more people in our life who might need assistance. To be completely exposed here for a moment, this realization actually made me feel overwhelmed and futile in my efforts. “Why bother “preparing” for anything or living in any particular way if we’ll always be ill-prepared for something or always find more people who might need our assistance?” But it was because I asked this question that I realized that the peace and comfort doesn’t come from checking off items on a list. There’s not much of an accomplishment to speak of just because you take one CPR class or one solar oven cooking class and never revisit it again. Nope, the peace and contentment comes when this whole “preparedness” stuff is your happily chosen lifestyle as opposed for waiting for some historical cataclysmic event. Obviously, this is only a fraction of that journey from Food Storage to Self-Sufficient Living, but it’s my hope that what we do here at Preparedness Pro will help anyone and everyone who wants to take that journey with a helping hand, every step of the way, regardless of where a person is on that journey when they come to us. In the meantime, please forgive me if I make a face when I hear those words which I now loathe such as “food storage” or “emergency preparedness”; I’ll try to refrain, but know that it’s only because I see those issues as a distraction from what's really important--simply baby steps towards a much more fulfilling and peace-filled lifestyle where panic and fear don’t stand a chance of thriving. When those times come in which we find ourselves ill-prepared, we just need to recognize them as miraculous and loving learning opportunities, and when those times come when we are able to step up fully prepared to help ourselves and others—those are the opportunities for us to thank Him for the previously learning opportunities. *grin* Come aboard and enjoy the ride. For those of us that are new to this process (I have been doing this about a year now ~ poor Kellene who is SO patient with all the questions!). I am still working on the one year supply so am in the "food storage" mode, our goal is that once we have the year's worth of items we feel we will need then we can start the rotation process so no food will be over a year old since we will be using what we "store" and replenishing the "stock". So glad we found your site and that you have been so generous with your knowledge so those of us who DO feel things are changing (and not for the better), we will be ready for whatever comes our way. Yes, it is a great peace of mind! My husband is totally "on board" now and we have met a great number of people who are like minded so are building a "community". It's great! Thank you again for all that you do! I too am printing out bookmarked items from my computer. My family thinks I am paranoid but hopefully they well be able to use my preps and resources when the time comes. I am looking forward to learning low budget solutions to put to use. I had read about storing water in large soda bottles, but I had not taken the next step to store powder items such as flour or sugar in them. After reading about it, I asked myself how I had missed such an obvious next step. I am looking forward to your next installment. God bless you for doing this. Kellene, I started my preparedness journey after a four day power outage. I found you after watching you on doomsday Preppers. I spent the last year glued to your site and learning as much as possible. My goal for 2013 was to focus primarily on physical preparedness. After smoking for 27 years, I honestly thought I would never be able to quit. How could I be prepared for anything if I couldn't run up a flight of stairs without gasping for breath. I set my quit date, mentally prepared myself for what I feel would be the hardest thing I've ever had to do. I want to thank you from the bottom of my heart, using your principles of preparedness , I have been able to quit smoking easily and successfully. You are an inspiration to me. crisco: Thank you for posting your story! That's actually really inspirational to me, as I just started this journey a few months ago, immediately after buying my first house at the age of 42 (I wish I'd known about prepping a bit earlier...would've gotten a place with less house & more land)! My husband is in his 60s and doesn't quite "get" why he should bother with the preparedness lifestyle at his age, so I'm going to tell him about you! Good Morning,,,I for one,,love your input and out take on all this crazy world has to offer us,,,if it's not one thing,,it's another so to speak:: One thing I'm doing right now,, is printing things out and placing them in a good old fashioned Traper Keeper: my fear,,is loosing power,,hence loosing our internet access,,,so; very inportant ideal's, recipes & basic how to's,,,"this is how you do this" w/ step by step instruction's::as long as we can read,,,my book is my link to the internet:: I'm a firm believer,,,we have to be responsible for ourselfs:: we should take care of us:: and one day our access to say "you" may be taken away::by what ever::an EMP, War, Our own goverment:: but if we loose it,,,,I know I will have as much information that I could gather,,,in my book:::Lot's of love,,,wish you had a book! I have been making copies of articles for quite some time now. I have many binders full but I feel I will some day be glad I did. A wise woman said “If we are prepared, it is not an emergency.” hee, hee. So it would follow that ill-prepared is simply a learning opportunity. I cut my hand severely last month while slicing cabbage on my mandoline. It was the opportunity to re-evaluate what I have on hand in medical supplies. Conclusion, fairly good on medical supplies, but now I have three kevlar gloves for protection. I AM ON BOARD & TRULY ENJOYING THE RIDE! In, fact, I think I have FINALLY found my calling! Thank you Kellene for giving sanity to all of this! God bless you always! Everything happens for a reason. For every reason teaches us more and more. At a young adult age I was faced with my mortality. A car accident changed my life for the good. I walked away from something I know I very easily could not have. It was because I asked HIM to help me that I have time today. From that time on I looked at life as if I have the "just in case" items, there won't be a "just in case" issue. I did not realize I was at the very begining of my self reliant lifestyle. It was not until I became a Mom of 3 kids, who chose to stay home after the 3rd one was a year old, that I was truly going to focus on self sufficiency. One day while in my small steps, and feeling overwhelmed I was guided to find Kellene's abilities. I live hundreds of miles from her, never met her, but, I know I am ever so thankful. Because finding her blog helped me find the peaces I needed to calm myself and focus. I only hope I can lead by example as well as Kellene as in my community. Thanks Kellene! I really could not have gotten as far as I have with out your sharing of successes and fails. I look at each challenge as a chance to learn more and when you realize you are not alone, well, there is peace that comes with that. We started on our journey in preparedness in 2010 and it has been life transforming. Kellene speaks of the "what if''s", the contingencies, the ability to switch gears. The challenges engage you, the process makes it personal, the results becomes automatic. The 10 Principles are perfect for each of us to become aware of who we are, what we can handle, what needs some impovement. In the short span of two years I learned to shoot, got a concealed carry, obtained a HAM radio license, developed a garden that allows us to eat fresh almost year round, relearned canning, stocked my shelves, became a fan of medicinal herbs and oils, started enthusiastically studying the Bible, reading more, learning new things and enjoying life with a new persepective. I am 65+, the years don't matter. The process is a game changer, an elixer of youth. Fear of the unknown can destroy, preparing gives enormous peace. Kellene you have been a bouy in the storm of "change" and approach preparedness with knowledge, spirtual grace and a sense of humor. I have learned many things from your website and eagerly await the next 100 days. Ladies and gentlemen..start your engines! Thank you Kellene! Your articles are such a comfort and a true blessing. It's easy when you are doing this alone to feel no one else shares the concern you do. It's people like you and your readers who give support to those of us who don't have a family member who is of like mind. God bless you!